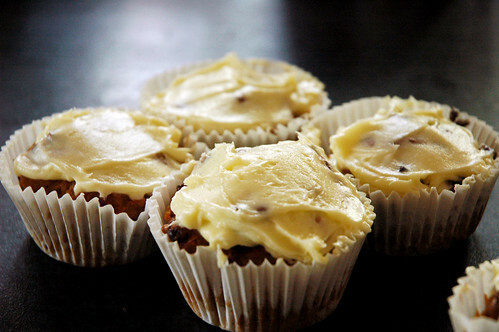 Carrot Cake Muffins – o frabjous day! 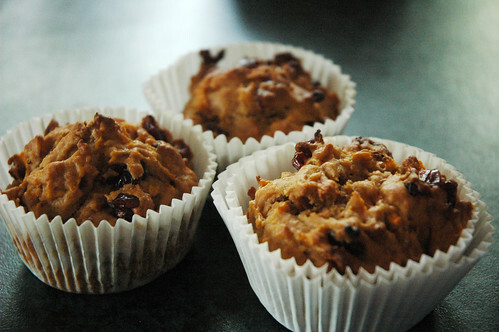 I think these are the loveliest carrot muffins I’ve ever made – soft, moist, and delicious with or without the icing. I altered a recipe in Penguin’s Muffin Bible, and was extremely pleased with the results. In a large bowl, mix the flour, brown sugar, baking powder, baking soda, salt and cinnamon. In another bowl, whisk together the oil, egg and vanilla, and then stir in the mashed pear. Pour the wet ingredients into the flour mixture, and stir until just combined. Gently stir in the grated carrots and cranberries. Spoon into a muffin tin and bake for about 15 to 20 minutes. If you want to ice them, mix together cream cheese with icing sugar and a dash of lemon juice until creamy. I never measure amounts for this – I keep adding icing sugar until it tastes right, and lemon juice to add a bit of tang and moisten the mixture. When is a muffin a muffin, and when is it a cupcake? I think of cupcakes as plain small cakes (like a butter cake) with fancy icing of some sort, and muffins as denser and with specific flavours. And bigger – I think you do cupcakes in smaller tins.